Hi y’all! I just wanted to say thank y’all for sticking around and helping support Cream Of The Crop Crochet. 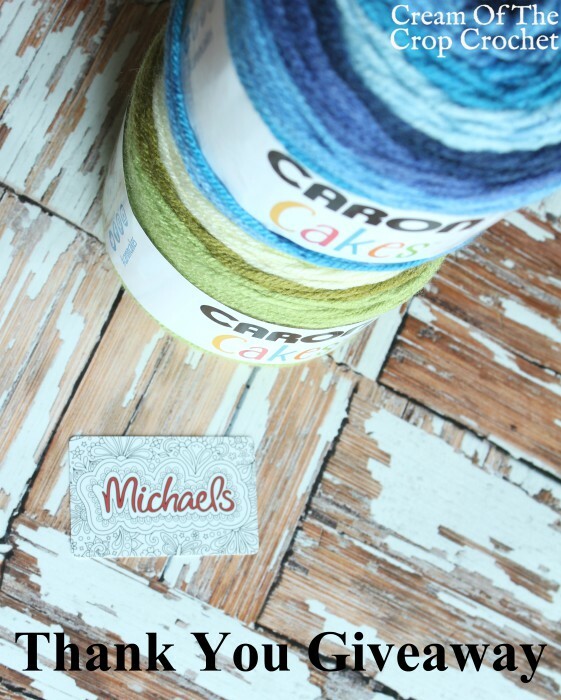 I was thinking and thinking about how I could say thank y’all, and what better way than having Caron Cakes and $25 Michael’s gift card giveaway! I’ve also been trying to figure out what else y’all would like for future giveaways. Let me know in the comments of this post! This got my attention. Patterns or kits would be future giveaway ideas. Yarn, hooks, gift cards are good giveaways. Love to see some other cakes as a giveaway. I love the yarn & gift card giveaway’s. Those help to get any supplies needed, to go with the yarn project I’ve decided on, for the giveaway yarn. Thank you for all that you do for us. I like yarn and notions as giveaways. I love this giveaway! I hope that I win. An idea for future giveaways…… How about point protectors and alpaca yarn. I love alpaca yarn. Its my favorite to work with! I’m new to your group but already found it very informative and helpful. I like anything as I am appreciative and happy that you sponsor giveaways! Fun find in my Pinterest feed. Thanks for a great giveaway, so awesome. Maybe some Dk weight cotton yarn for summer things. I would love to see more yarn giveaways! I love natural fibers and specialty yarns. 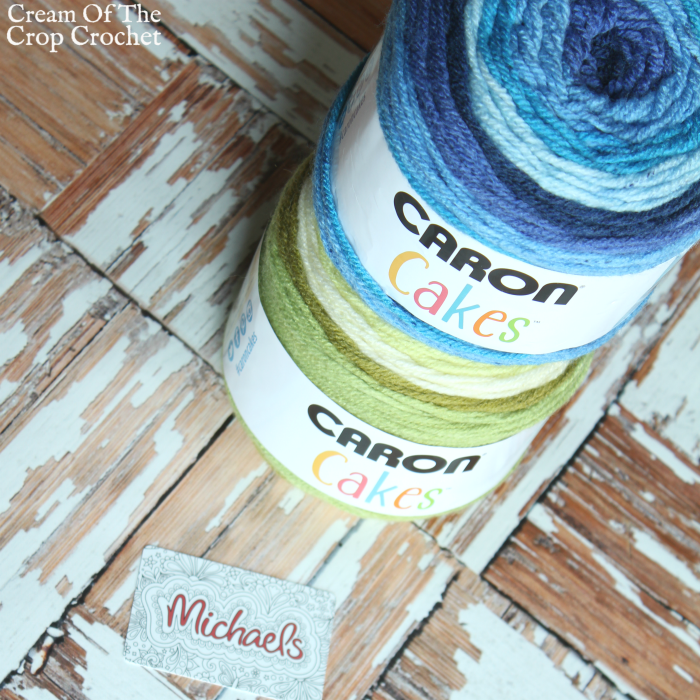 Thank You for a chance to win some Caron Cakes ! Pretty colors ! Thank you, awesome giveaway. Ysrn is always s great choice for a giveaway. Some of the RH Ombre or Mandela yarn would be nice, because I can’t find them where I live. Would love to see crochet hooks, yarn, crochet books, etc. 🙂 Love your blog! Thank you for the wonderful giveaway, great prize! Thank You for all you do! I would like some crochet books please? Thank you. I’m loving your FB page posts. This is so great! As for potential future giveaways… Maybe a fun, pretty hook? Or a project bag? Those are awesome! Or a yarn-bowl?? There are so many fun crochet-related products!! 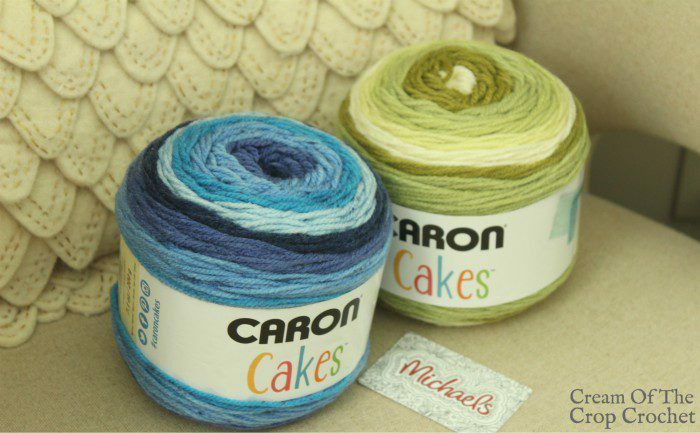 I just love Caron Cakes … both colors you are giving away, but I’m especially in love with Pistachio! I have so many ideas for them! Thanks for the opportunity. A suggestion for giveaways … all the “little” stuff that crocheters and knitters need … stitch markers, stitch counters, needles, hooks, yarn needles …. and of course YARN! More yarn and crochet accessories. Thank you so much for this giveaway. I would love to see a crochet kit giveaway. Keep up the awesome work! Gift cards to Joann’s would be nice also. Love yarn and hook giveaways! You can never have too much yarn, so that’s always a great thing to win. Yarn and crochet hooks would be great! I love seeing all kinds of yarns, knit or crochet supplies(mini scissors, stitch markers, etc), books. There are some really cute Red Heart Super Save Stripes which would a great giveaway to make all sorts of crochet projects. Ergonomic hooks are very handy as well as Amazon gift cards. I’d love any needke giveaways! I would love to see more and more yarn and also more Michael’s gift cards please. Thank you. What a thoughtful giveaway! Thank you! Who could turn down yarn, thanks for chance to win! I like the way you are doing it now. How very generous of you! Yarn, anything crochet would be nice. Thanks. I have been eyeing those crochet stands and of course any type of yarn!! I love the opportunity to try new yarns for my crocheting and knitting! always glad to get any freebies associated with crocheting. Thanks forthe chance. I would love to see more yarn or yarn and pattern giveaways. congratulations on your success! Yarn looks yummy, thanks for the giveaway! Such beautiful yarn. Wonderful to work with. Love Caron yarn! Bull’s eye! What more would a crochet-er need? Yarn amd a gift card is just perfect! ❤Yarn and crochet..would love to win ? hope everyone is having a terrific day!! I want to work with Caron Cakes SO badly!! I can only imagine the possibilities. I would like almost anything yarn related, lol! Also my instagram name is @oneangelonly. I tried to go back and fix it as I didn’t notice an error until I clicked on the submit button. I haven’t used Caron Cakes yet and would be excited to do so! Anything to do with crochet is awesome thanks for the chance! Michaels or Joanns gift cards are always good! Crochet hooks, stitch markers, yarn, pattern books, gift cards! Thanks! So nice of you to offer this giveaway! Hooks are always amazing giveaways. Thank you very much! Crochet tools are always a good gift idea – and the yarn is a great choice, too! Thank You for the opportunity for a chance to win this yarn and gift card. Oh how I love this yarn!! Thank you for this awesome giveaway! 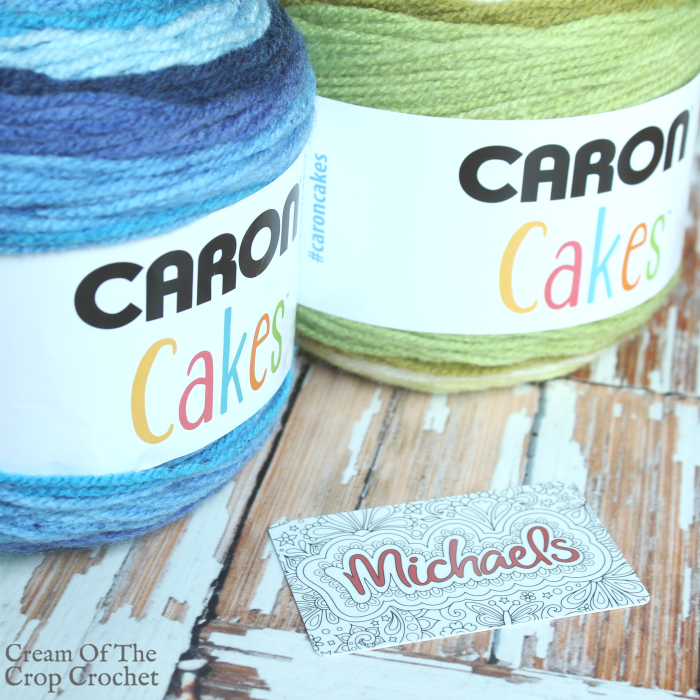 I love Caron cakes and Michaels! For future giveaways some other cool things for prizes would be teaming up with a local indie Dyer or an Etsy shop Dyer to do like a dual giveaway. You could do like a sock yarn or sport weight kit giveaway. Or maybe a craftsy kit! Yarn is always a great giveaway! Yarn. Yarn, and more yarn! More caron cakes for future giveaways! I like yarn, patterns, yarn,,, LOL! Any giveaway that involves yarn or funds to buy yarn is great in my book! I’d love to win yarn any time! Yarn is wonderful! So are cushioned crochet hooks, and maybe even a pattern book on fancy stitches or different edges. I’d love to try this yarn. In the future it would be helpful if the gift were the same color yarn. Hope i win! Future giveaways could include a customized crochet hook. For give aways, Yarn is always best – one can never have too much yarn. There is a widget form above in the post. Yarn! Yarn bowl! Stitch markers! Maybe crochet hooks in the future but yarn is always great! Great giveaway! Thanks for the opportunity ? Would love to see some fancy hooks giveaway! What else? Yarn and craft store gift cards are the perfect prizes! I’ve been wanting to try out those Caron Cakes. Love Caron cakes! Love Michael’s they have a great yarn selection! Pick me! Pick me! I have never used a Caron Cake. I am thinking this would make a very nice scarf for Operation Gratitude.Future give away… more yarn. ? More beautiful yarn… keeps my imagination flowing!! Different types of yarn are always fun for giveaways! i’ve mainly stuck with a few different brands, but I’m trying to branch out. Awesome giveaway! Yarn is always a good choice… And patterns! Thanks for the chance to win! Love this yarn! A set of needles with a pouch! It makes it so much easier to keep everything together. Thank you for the chance! My fingers are crossed!! The question asked was, “What would you like for future giveways?” YARN…! Yarn is always good. I agree with the crochet hooks idea. Maybe some cute/fancy ones since sometimes we buy the affordable plain ones and deserve something pretty. Love Caron Cakes! I made sweaters for all my grandkids with it. I have tons of crochet project ideas I want to complete especially for my kids, so winning anything that coincides with crocheting would help keep me stocked up and going. Yarn is always a good giveaway!! Yarn is always appreciated! Thanks! More cotton scrubby yarn please!!! Hand dyed yarn would be cool for future giveaways! I love giveaways that offer newer items that I might not have tried yet, gift cards are always a great choice. Thank you so much for the wonderful giveaway. I would love to see CAL and some random fun giveaways. It would be great to see the crochet community together on one platform. Have you love to win some urbanomics crochet hooks. I am wanting to try them but I’m afraid I won’t like them as I’m getting older though my hands really ache. I never win but fun even still!! Maybe some crocheting hooks, Thanks for the chance to win. Hi Carol! I’ve added another entry option that doesn’t require any social media. Good luck! But I would LOVE to win this…and try this lovely-looking yarn….I have a couple of projects in mind for which I’d use this. Thank you again for the chance!